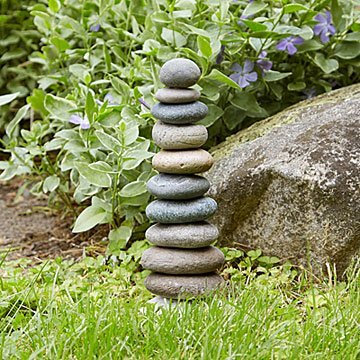 This handmade, decorative cairn seems to defy gravity, and can be displayed indoors or out. Display this handmade accent piece as a reminder of something special, or just for its fantastical beauty. Thoughtfully piled rock cairns can be found in every part of the world, and have been built since before recorded history. They mark paths, commemorate victories, or memorialize lost heroes. Jeff Henderson adds an artistic twist to his cairn, placing smooth river rocks one on top of the other, until they seem to defy gravity. Display this mystical marker inside or out—there are rubber pads under its base to protect your indoor surfaces, and a removable aluminum rod to support it securely in your garden. Handmade in Eliot, Maine. For indoor or outdoor use. Aluminum stake included to secure garden cairn into ground. This cairn is just lovely. There's no visible indication of how the rocks are attached. So pretty, and perfect for my home in the mountains. For now it is on my fireplace mantle but I have kept the stake in the event I choose to move it to my garden in the future. Visitors have all noticed and admired it. The cairn is an interest provoking item in my garden. I've gathered flat, round stones and visitors can try to match the purchased cairn on my garden table. Record so far is 14 stones. Love this! It's heavy and stands well. I use it in my shop window along with my yoga dog and yoga cat statues and everyone loves it. Much nicer than expected. it's even better in person! I have had a flower planter in the front yard for the past 20+ years. The flowers always die. My cairn will be in memory of all the flowers that have perished under my care. This product was even better than I had imagined! Very large and artistic! This looks great in my flower bed. It always catches my eye and my interest. I want more! I bought this for my mother for being the "rock" of our family during my father's cancer treatment. They love to garden and love their little sculptures. This is certainly a special one given the meaning behind it. However, even on its own, I find it an attractive, unique and eye-appealing addition to the garden. Okay, I love rocks.. I collect one from each place I travel to for work or pleasure. I love this piece of "art" which at first I was going to place outside, but now I am keeping it inside to keep it safe and sound.. Well ok, I just love looking at it.